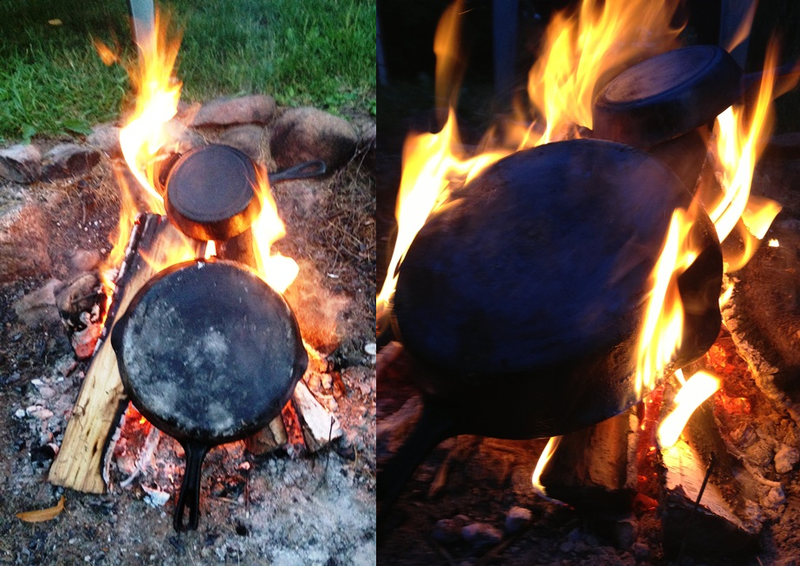 Like any good adventurer, or any good cook for that matter, I love cooking in, on, and around cast iron. Not so much “around” it, because that’s pretty useless. I just wanted to round out my preposition series. Until recently, the only cast iron in my possession has been a 10″ chicken fryer. Sure, I can bake casseroles, cakes, and fry….well, chicken, in it, but it’s a somewhat limited piece of cookware. When my grandmother passed away in August, I managed to come home with some righteously old school, high quality cast iron. I got a 3″ egg pan and an 8″ frying pan. The only problems were that they had decades of food build-up and starting rust. 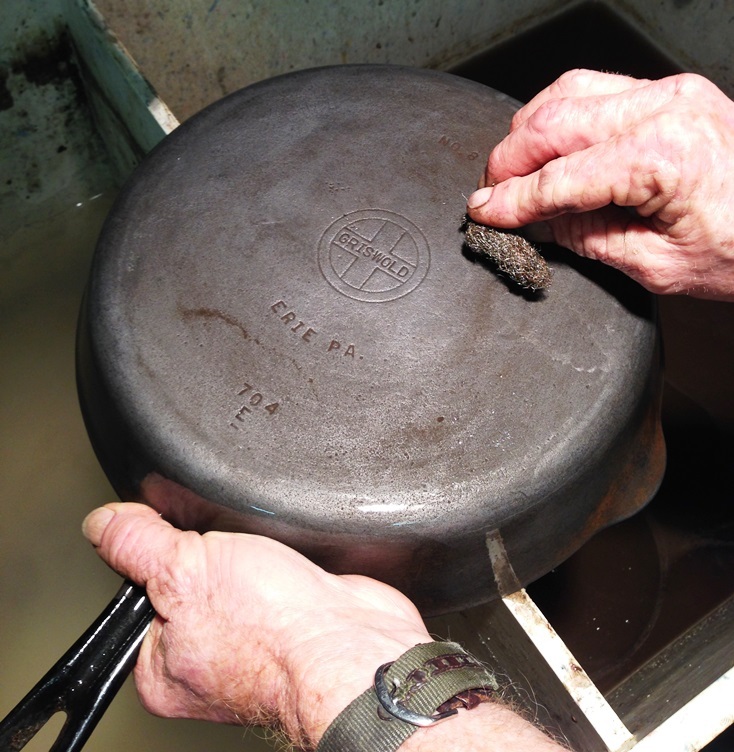 I’m sure we’ve all seen pans in these conditions at garage sales or secondhand stores and passed them up because they were “worthless”, but you will not be so foolish anymore after reading this! These two pans, along with the chicken fryer when I received that one as well, have all been refurbished in the exact way. If you do a little google searching, you will find tons of information on the subject. In fact, that’s where my dad got his information so I’m not claiming this to be a definitive source. I’m just saying we’re (mostly, “he’s”) batting 100% on refurbishing more than 6 pieces of cast iron. First, grab a beer and start a campfire. Then, drink a second beer as you build up a nice base of coals. Once you’ve got decent flames and decent coals, throw the cast iron right on in. Yes, that’s right. Throw your cast iron in the fire. This will burn off all the previous seasoning, excess grease, and food build-up. You can see on the right where the pan has actually started on fire because of that nastiness. If you’ve got a good fire and good coals, it should only be in for around 30 minutes. Any more and you may end up warping your cookware. Es no bueno. And speaking of warping, these pans may very well be cherry red as you’re taking them out. First of all, please don’t grab them with your hand. Jesus. Secondly, use utensils like shovels and sticks and anything else that isn’t your hands, but be very careful not to drop them on a hard surface. Again, cherry red metal deforms easily. Thirdly, don’t cool them ultrafast. Not only could that causing warping too, but you could actually crack your cast iron too. And then it’s really worthless. What we do is keep them in the fire pit, but pull them off to the side. Then after awhile, put them up on the grass closest to the fire. And finally, pull them away so they can fully cool. Don’t worry, this is where it starts to get awesome. All that brown and white crusty stuff is all the previous gunk that still on the pan, but no longer attached to the metal. Put some gloves on, wear a mask, and take some steel wool to the cast iron. Most of it should all flake off pretty easily. For the most part, the metal should feel smooth to the touch, even if it is still discolored and rusty in places. Next, mix a tub or utility sink or any other liquid holding vessel with one part white vinegar and one part water. i.e. 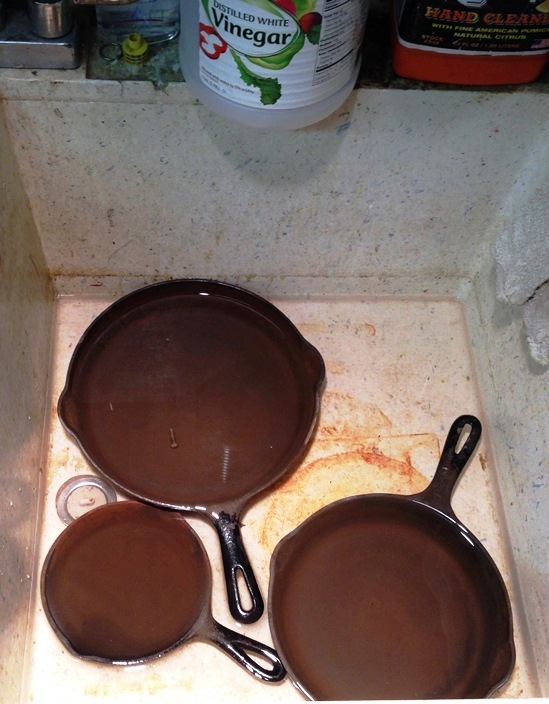 1/2 gallon of vinegar, 1/2 gallon of water…or whatever it takes to completely submerge your cast iron in the mixture. Once you think the rust has all disappeared, get out your gloves, mask, and trusty steel wool one last time. Give your cast iron a good working over with the wool, and don’t be afraid to take a new piece of steel wool if yours is getting dull/wearing out. This is the last chance for you to get all of the gunk and rust off your pans. They should really start looking new again after this. Rinse your pans thoroughly with water, do a quick dry with a towel, and then get them in a hot oven to evaporate the remaining water. If you know what you’re doing and watch closely, you could also do the final evaporation over a gas burner too. The key here is to not let them stay too dry too long without a protective layer of grease. Without that layer, NEW rust will literally begin to form right in front of your eyes. Es no bueno. Look how sparkly and new they look compared to when we took them out of the fire! 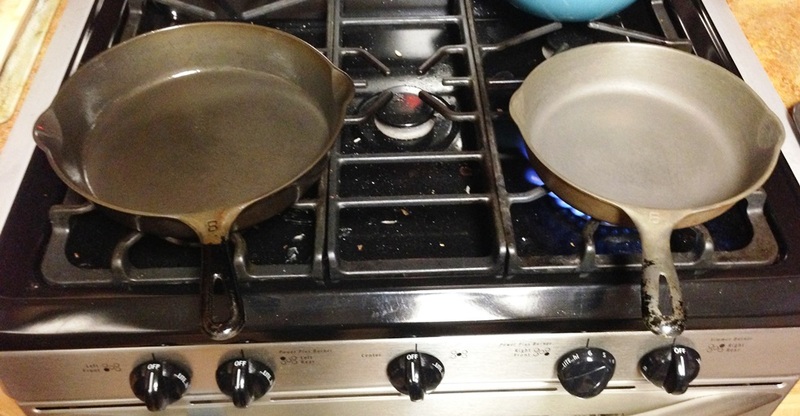 The pan on the left already has its first coating of grease, waiting to be seasoned. The pan on the right is just finishing drying. The grease was added immediately after the picture. To do this, coat the entire pan – front, back, top, bottom, side-to-side, underneath, over-the-under, and all the other prepositions you can think of – with a high smoking point cooking grease or oil. We like Crisco or peanut oil, but I’m sure you could find something to your liking if you have something against those. Now, “coating” doesn’t mean, “leave it a sloppy, dripping mess.” You can coat everything easily and nicely without being obnoxious. Use a paper towel to remove the excess, and there will still be enough on the cast iron to season it properly. Once coated, pop it in the oven, or a regulated gas grill outside, set around 350 degrees F for about an hour. If you’re using your oven, put some tinfoil underneath to catch the excess grease drippings. Or don’t. Totally up to you. This may also smell up your house a little so it’s really nice if you have a big enough gas grill out your back porch. For the best results, season your cast iron 2-4 more times before you use it again for the first time. Or if you’re impatient like me, just make sure you cook some really greasy food (like BACON) over low heat the first couple of times. And there you have it, brand new cast iron cookware. So get out there and rummage through the garage sales! Es muy bueno!